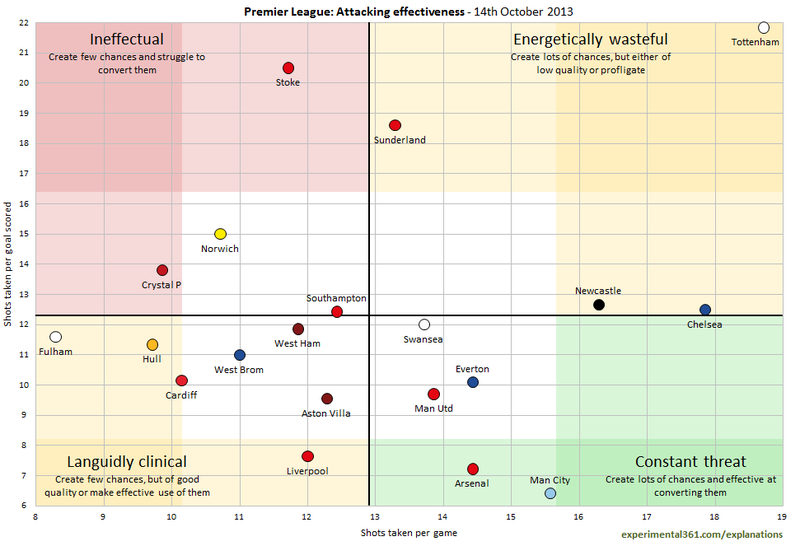 Graphics as at 14th October 2013. Click to enlarge in a separate tab. Explanations via the menu above. Tottenham are currently the most wasteful side in the division – although Stoke and Sunderland aren’t too far behind – but they’re creating a ridiculous number of chances to compensate. Liverpool, Arsenal and Man City are the most clinical teams in the division, with the latter the most impressive due to the volume of chances they’re creating. As mentioned above, Fulham‘s position here – they’ve had to deal with an extra 7 shots per match compared with the average side – is all the more worrying when you consider that they aren’t creating many chances of their own. 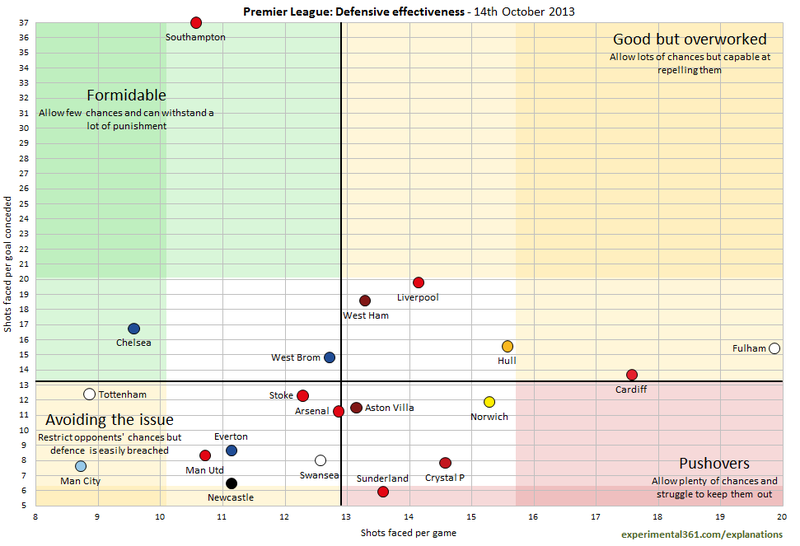 Southampton‘s defence has been amazingly solid so far – they make Chelsea’s impressive record look almost average. Sunderland and Newcastle really need to tighten things up, as do Man City who at least aren’t allowing many attempts at their goal. Is it possible to have a statistic for loss of possession, as (1) Just misplacing a pass and (2) tackled/losing the ball. So, number of passes attempted per game, and number of times possession lost per game becomes a statistic. I’ve been concerned for a few years now about the number of times we (Chelsea) just give the ball away and would be interested to see how we compare top other clubs. It certainly is possible to derive this and I can see the value in it. It’s not data I currently possess I’m afraid, but if you look at the stats available on WhoScored.com or Squawka.com you could build up a picture of this based on Chelsea’s pass accuracy and their opponents’ successful tackles. Could you create a graph for each game week? I want too see/make a combination of these images to create a gif that would show the progress each club makes over the course of the season/period of games. Thanks. I don’t always have the time to produce one for each week, but I am looking into ways of showing progress over time. Hopefully later this season a more interactive version will see the light of day, or at the very least an animated GIF. Thanks bro. Good luck with it.